Come celebrate this extra day over at Vega Tapas (2051 Metairie Rd.) It's Leap Day 2012 with an Art Party, come see the debut of a new collection of fused glass..."all things NOLA" and the beautiful dining room transformation. Art glass depicts local favorites such as Mardi Gras, music, shotgun houses, seafood, streetcars and much more. Besides all the wonderful art there's gonna be sangria, wine and tapas for all!!! Keep celebrating Leap Day over at Chickie Wah Wah (2828 Canal) in Mid-City with a Leap Year Birthday Celebration. The fun starts at 6:00 pm with Some Like it Hot - then at 8:00 pm it's Bruce Sunpie Barnes and the Louisiana Sunspots (cover)!!!! Come on - you only get to do this every four years!!! Lookin' for some dinner and then some music for dessert? Rock 'N Bowl (3016 S. Carrollton) is the place! Get some yummy dinner over at Ye Olde College Inn and then get a half price ticket to the show right next door at Rock N' Bowl....Tonight they've got piano playin' man Joe Krown at 8:30 pm! Good Morning Everybody - and happy Tuesday!! You can get your day started off right with a trip to the Farmer's Market!!! Visit the Crescent City's Farmer's Market at University Square (200 Broadway) from 9:00 to 1:00 pm and get some yummy lunch with Pam Warner, a.k.a. Hot Tamale Mama under the Green Plate Special Tent this month. Pam will have her tamales (beef or eggplant-portabella), cheese grits, black bean & corn salsa, and homemade vanilla-almond custard....yummy!! It's gonna be a lovely evening for some music on the Avenue over at the The Columns (3811 St. Charles Ave.)...Have a fancy cocktail and listen to the guitar stylings of John Rankin! Head on over to Mid-City and to Chickie Wah Wah (2828 Canal)! They've got two amazing shows with The Scissormen at 7:00 pm and then onto Marc Adams and his House of Clements about 9:00 pm - and come hungry for delicious pizza, pasta, salad and more!! Right down the street the Spotted Cat (623 Frenchmen) has a triple header with no cover - Brett Richardson at 4:00 pm, Aurora Nealand & The Royal Roses at 6:00 pm and top off the evening with Meschiya Lake & The Little Big Horns at 10:00 pm! TGIF!!!! Get your weekend started off right with wine tastings!! Always a fun way to kick things off. It's the weekly wine tasting over at Cork & Bottle (Orleans at Moss St.) - from 5:00 to 7:00 pm. Come out and sample some fantastic wines! Starlight Racing at the New Orleans Fairgrounds (1751 Gentilly Blvd. )celebrates the Oscars with Hollywood Glamour night!! Groove on down to the sounds of on with the The Mixed Nuts and DJ Digital! Gates open at 4:00 pm and the first post is at 5 p.m. The live bands take to the Clubhouse stage at 7 p.m., while the DJs in the Miller Lite Beer Garden spin nonstop until after the last race, about 9 p.m. Check out Friday Night at NOMA with Where Y'Art tonight from 5:00 pm to 9:00 pm! Head on over to Chickie Wah Wah on Canal for their happy hour and a double header of music this evening. It's Amy Trail at 5:00 pm and be sure to stay on for Paul Sanchez and Alex McMurray at 8:00 pm!! There's a small cover for Paul and Alex - but you know they're worth the dinero! Come hungry too - there's delicious pizza and other yummy items being served up! You can get started early at the Spotted Cat (623 Frenchmen) with Brett Richardson at 4:00 pm, St. Louis Slim and Andy J. Forest at 6:00 pm, and top off your evening with the New Orleans Cottonmouth Kings at 10:00 pm. d.b.a. 's (618 Frenchmen) got Meschiya Lake & the Little Big Horns at 6:00 pm it's FREE, but don't forget to tip the band!! And stay on for Iris May Tango at 10:00 pm...there's a $5 cover, but you don't want to miss the show!! Don't miss out on the weekly tasting at Cork and Bottle (3700 Orleans) about 5:00 pm in Mid-City. Come sample some delicious vinos and kick off your early weekend reight! You can also stop at Clever (right next door - don't even have to walk outside) for their happy hour specials after attending the free wine tasting. And be sure to stop by the Crescent City Farmer's Market (right outside the door) and patronize local Louisiana vendors with fresh veggies, seafood and more!! Need a little art, culture and music? You gotta go to the show at the Ogden Southern Museum of Art (925 Camp St.) - better known as Ogden after Hours. Tonight the Ogden celebrates a literary musicians theme via New Orleans: the Underground Guide. Local musicians Mike Williams, 10th Ward Buck, Ratty Scurvics, James Marler, Luke Allen, Gwendolyn Knapp and Peter Orr will read from their published works and perform songs, and photography by Zack Smith and Jonathan Traviesa will be on view. Be sure to head on over to the bar for this month's signature cocktail the - brandy milk punch! Remember if you're a member of the Ogden you always get in free! If you get there a little early head by the Circle Bar right around the corner on Lee's Circle for some great drinks!! And stop by after the Ogden too for Joe Adragna at 10:00 pm! And while you're in the neighborhood stop by the Bayou Beer Garden (326 N. Jeff Davis) for the Walter Wolfman Washington Trio at 8:00 pm!! There's more fun on Frenchmen over at d.b.a. (618 Frenchmen) with the New Orleans Cottonmouth Kings at 7:00 pm with no cover!! And stay on for more The Other Planets ($5 cover) at 10:00 pm - you don't want to miss it!! Happy Jeudi Gras Everybody...the parades keep on rolling along!! 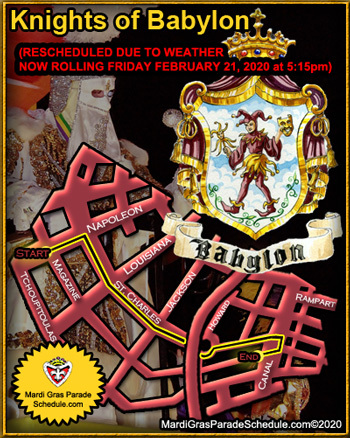 First up this evening are the Knights of Babylon at 5:45 pm....Formed in 1939 by professional men of New Orleans, the Knights of Babylon proudly adhere to traditional float design, which has remain unchanged for over 60 years. Also according to tradition, they continue to light floats with flambeaux and ride on 12-man floats. The king's float is drawn by a team of mules, followed by 12 riding lieutenants. Collectors of Mardi Gras throws are expected to line the route in droves, in quest of Babylon's exclusive jester heads and hats, Knights of Babylon backpacks, Knights of Babylon lighted disc necklaces, soft baseballs, cups and doubloons. Following right behind is the highly secretive Knights of Chaos, formed by former members of the Knights of Momus, first paraded on the traditional Uptown route in 2000 and does not unveil its theme until the procession takes to the streets. Baseball-type collectible cards, depicting each float and with a description of that particular title, will be thrown by Chaos members. This tradition began in 2006 and was the first of its kind in the history of Carnival throws. Plentiful beads and trinkets are also promised, including Chaos Orange Demon lighted beads, plus plush Chaos knights, float-specific cups and more. Also expected to be thrown to spectators will be doubloons and many trinkets signifying the generosity of the riders. 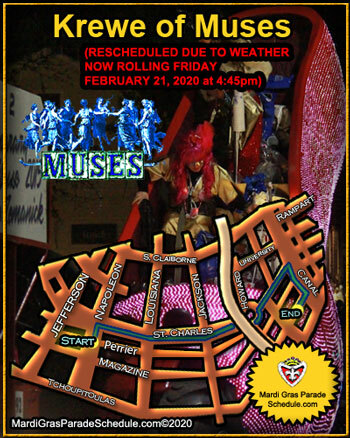 And rounding up the evening the Krewe of Muses rolls on a slightly different parade route (see below), named for the daughters of Zeus and patrons of the arts and sciences, is New Orleans' only all-female night parade. The parade has become one of Mardi Gras' favorites, thanks not only to its humorous and biting parade themes, but also for its sought-after throws....SHOES!! And AFTER the parades there's free music!!! At the Howlin' Wolf (828 S. Peters) every night at 10:00 pm thru Lundi Gras!! Check out the line-up! The Krewe of Nyx, immediately follows Druids. Get excited for the inaugural roll of the all-women parade named for the Greek goddess of the night! It's another secret theme for this 20 float krewe..so get out there to check the ladies out tonight! If you're not feeling like parades tonight come out and support the New Orleans Police Department's Mounted Horse Division and enjoy your favorite foods from Galatoires, Cafe' Reconcile to just name a few! Head to the Equestrian Center on Harrison Avenue and Marconi Drive in City Park from 3:00 to 8:00 pm for Horses, Hops, and Cops! Take photos with the Budweiser Clydesdales, participate in family-friendly activities, and enter a raffle to win a ride on the Budweiser wagon in the Mardi Gras parade! All proceeds support the N.O.P.D. Mounted Division that has been a crucial aid in deterring and stopping criminal activity in New Orleans. After your Uptown parades head on over to Le Bon Temps Roule (4801 Magazine) at 10:00 pm for some Egg Yolk Jubilee - what a perfect way to top off your parade goin'!! And....Happy Birthday Bunny Matthews!! For more after parde fun - head on over to Tipitina's (501 Napoleon Ave.), for a big Bunny Matthews (Creator and cartoonist of "Vic and Nat'ly.") birthday party! The party starts at 9:00 p.m. with Jean-Eric, the Jonesburds, Al "Carnival Time" Johnson and Reverend Spooky LeStrange and her Billion Dollar Baby Dolls - cover is $11, but you don't want to miss this Bunny's birthday!! Good Morning Everybody - Love is in the air!! You can get your day started off right with a trip to the Farmer's Market!!! Visit the Crescent City's Farmer's Market at University Square (200 Broadway) from 9:00 to 1:00 pm and get some yummy lunch with Pam Warner, a.k.a. Hot Tamale Mama under the Green Plate Special Tent this month. Pam will have have jumbo stuffed shells in Parmesan cream, covered in red sauce, and side salads with Meyer lemon dressing. She'll also have hot tamales, custard and black bean and corn salsa packaged to go.....yummy!! For all the singles out there (or couples who want to hear some great music!) The New Orleans Center for Creative Arts (2800 Chartres St.) will put on a "Valentine for Singles" concert tonight at 7:30 p.m. Musicians - all single musicians - will perform jazz and classical numbers, NOCCA's classical music students perform an opening act beginning a half hour before the concert itself and its culinary students will provide snacks for afterward. It's gonna be a beautiful evening for some love music at the The Columns (3811 St. Charles Ave.)...Have a fancy cocktail with your honey and listen to the guitar stylings of John Rankin! Chickie Wah Wah (2828 Canal) has an amazing Valentine's Day show! Have a happy love holiday at tonight with the Kevin Gordon Band playing from his officially released CD "Gloryland" today - you don't want to miss this show - and come hungry for delicious pizza, pasta, salad and more!! Happy Monday Everybody - Hope everyone had a fun filled parade weekend!! There's some good stuff going on tonight! Celebrate Carnival tonight with the 2.2 Social Aid & Pleasure Marching Club - The theme is "Have fun it's Mardi Gras" and the group kicks off at 7:30 pm...The royalty this year is King 2012: King David Turgeon and Queen 2012: Queen William Smith Jr. ....Throws: Purple, Green & Gold flowers from canes. The history of the club: They follow in the footsteps of the Garden District Carnival Club which originated in the Irish Channel. The King, who started the organization, marched in the GDCC as a child along with his father & grandfather. We will be stopping in at 5 locations along St. Charles Ave. during our march for refreshments, starting at Fat Harry's and including Commanders Palace to make 6 stops in total. Come out tonight and see if you can catch up with the Club!! Satisfy your hunger for great food and music over at Three Muses (536 Frenchmen)...Tonight they've got local Iguana Joe Cabral- don't miss him! It is Carnival Time -This is what Gratis NOLA is all about!! Saturday Parades, Fun and Music! The parades kick off this morning at 11:00 am on the best bank with the Krewe of Choctaw running on the Algiers-Terrytown route. This year's theme is "Listen to the Music"...Be sure holler for the plush tomahawks and spears and the special wooden nickels! Following Choctaw at 11:45 am are the Mystic Knights of Adonis with the theme "Adonis in Louisiana: 200 Years"
And the parades keep rolling!! Catch the Krewe of Pontchartrain at 2:00 pm on the traditional Uptown Route - This year's theme is "Where is What Louisiana Festival?" Look out for the special krewe magnet! Keep hanging out Uptown for the Krewe of Sparta at 6:00 pm - The theme is " Le Carnaval Des Animaux" and keep your eyes open for the 60th anniversary medallions and a mystery throw!! Following Sparta is the Krewe of Pygmalion at 6:45 pm - Their theme is "The Name of the Game is"...Look out for the new signature float the Pygmammoth! 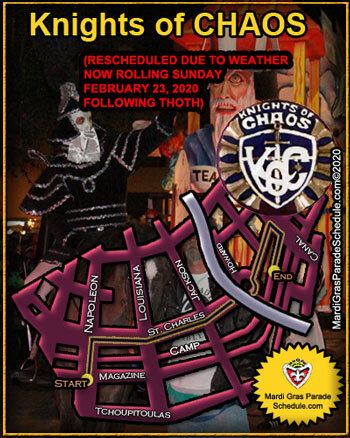 Out in Metry you got the Krewe of Ceasar heading down Vets Boulevard at 6:00 pm - The theme is "Festivals of the World". And what's a parade without beer!! It's a Collaboration Beer Party with Stone and NOLA Brewing Company!! Head on down to the Avenue Pub (1732 St. Charles) right on the parade route for and Pour Me Somethin' Mistah an 8% imperial porter with Steens molasses and local satsuma orange peels. Draft only and small batch. Parades go by all day and night during the release party. Drinking NOLA or Stone will get you access to the Balcony to watch the parades. In addition to the Porter we they're gonna have two casks including a wheat with satsuma peels and grains of paradise and the porter with a twist. Yea for beer!! Join us to spread the vibe, the creativity, the passion of Voodoo Ballerina. This is a not for profit event, proceeds go to local theater and art orgs. The Spotted Cat (623 Frenchmen) has a triple header starting early with Jayna Morgan & The Sazerac Sunrise Jazz Band at 3:00 pm, Panorama Jazz Band at 6:00 pm and top off the night with The Jazz Vipers at 10:00 pm!! And curb your parade hunger for food and music over at Three Muses (536 Frenchmen)...Get some yummy food and listen to the sounds of The Mumbles at 6:30 pm and stay on for the Frenchmen Street Jug Band at 10:00 pm. It's another amazing day of Carnival fun and more! Before Barkus (and after) come celebrate Spaghettibowl!! It's a block party fundraiser for Cathedral Academy in front of Irene's Cuisine (539 St. Philip) from Noon 'til 4:00 pm...They'll be delicious food from Irene's a jazz conert, and a scond-line by James Andrews and the Crescent City Allstars. Come on Uptown at Noon for the Krewe of Carrollton - It's 20 floats of fun with the theme "Celebrate Louisiana"! Following on the tails of Carrolton is the Krewe of King Arthur at 1:15 pm - their theme is "King Arthur Celebrates the Louisiana Statehood Bicentennial"..Look out for the stuffed dragons, spears and daggers! Head on over to the best bank at noon for the Krewe of Alla on the Algiers-Terrytown route - The krewe depicts "Alla's Astrological Odyssey" with a 24 float parade! And of course you don't want to miss dogs in costumes!!! It's the Mysic Krewe of Barkus parading through the Quarter at 2:00 pm! This year's theme is "Mission Possible: Canine Portocol"...Registration begins at 10:30 am in Armstrong Park - $50 for your pup and free for spectators! And if you're looking for that perfect costume on Sunday head on down to the Blue Nile (532 Frenchmen). Threadhead Records Foundation is the nonprofit sponsor for the 21st annual Carnival Costume Bazaar, which rises from the ashes of the Great Blue Nile Costume Bust of Mardi Gras 2011. A dozen of New Orleans' most creative designers, hatters, costumiers and mask-makers offer a vast array of one-of-a-kind costumes, masks, accessories, props & festive Carnival creations. A don't-miss event for people who take costuming seriously! Don't miss out on the weekly tasting at Cork and Bottle (3700 Orleans) about 5:00 pm in Mid-City. Come sample the latest craze, Whipped Lightening - alcohol flavored whipped cream (yep, think of the possibilities!) PLUS, meet the owner of Broker's Gin, Martin Dawson, and sample top notch gin. So, come sip, shop and pick up your favorite wine or liquor for Mardi Gras or Valentine's Day! You can also stop at Clever (right next door) for their "tasting special" - $1 off your first cocktail after attending the free wine tasting. And be sure to stop by the Crescent City Farmer's Market (right outside the door) and patronize local Louisiana vendors with fresh veggies, seafood and more!! Need a little art, culture and music? You gotta go to the show at the Ogden Southern Museum of Art (925 Camp St.) -better known as Ogden after Hours. The concert starts up at 6:00 pm with the 101 Drummers featuring Big Chief Monk Boudreaux. An offshoot of the 10-piece Mardi Gras Indian funk band, 101 Runners, the 101 Drummers focuses on the root percussion of the Mardi Gras Indian culture. This percussive musical chant and response is most often only heard at "Indian practices" held at different tribes, headquarters (usually the neighborhood barroom) on Sunday nights throughout Carnival leading up to Mardi Gras day! Be sure to head on over to the bar for this month's signature cocktail the - brandy milk punch! Remember if you're a member of the Ogden you always get in free! If you get there a little early head by the Circle Bar right around the corner on Lee's Circle for some great drinks!! And stop by after the Ogden too for The Other Planets with Sarah Quintana at 10:00 pm! There's lots of fun going on over at Chickie Wah Wah (2828 Canal) in Mid-City tonight! Come on over early for Happy Hour with Electric Yat String Quartet at 5:30 pm, and stay on 'til 8:00 for the Bradley's Circus! Make sure you come hungry for some yummy Garage Pizza!! There's more fun on Frenchmen over at d.b.a. (618 Frenchmen) with piano playin' man Jon Cleary at 7:00 pm with no cover!! And stay on for more Hurray for the Riff Raff with Tumble Weeds ($5 cover) at 10:00 pm - you don't want to miss it!! Happy Monday Everybody - Hope everyone had a wonderful weekend, and big congrats to Super Bowl MVP - Eli Manning!! Satisfy your hunger for great food and music over at Three Muses (536 Frenchmen)...Tonight they've got the sultry sounds of Kristin Diable - don't miss her! Be sure to make a stop by the Spotted Cat (623 Frenchmen) early for this great line-up of music...Brett Richardson at 4:00 pm, Dominick Grillo and The Frenchmen Street All Stars at 6:00 pm and be sure to stay on for the Krisitn Morales and the Bayou Shufflers at 10:00 pm.....it's sure to be another smokin' Monday evening show. GratiNOLA Weekend w/Markets, Beer Crawlin', Peeradin' & Lots o' Music! And there's more markets with the Piety Street Market at the Old Ironworks (612 Piety) from Noon 'til 5:00 pm - The Market is delighted to welcome Helen Gillet and Wazozo as their musical guests where they'll usher in Carnival season and serve as the opening act for this year's Krewe de Vieux parade.... 40+ vendors offer a festive array of Mardi Gras costumes, accessories & masks, creative art, handmade jewelry and crafts, homemade goodies, vintage collectibles and flea market finds in a bustling neighborhood market. See you there! It's a Bar Crawl with NOLA Brewing Company!! This year for the Release of Flambeau Red Ale NOLA Brewing Company is having a Bar Crawl through the historic French Quarter before the Krewe du Vieux parade. The Krewe du Brew Bar Crawl theme will be "Mardi Gras on Fire" and costumes are encouraged. *The Bar Crawl begins at 1:00pm starting at the R-Bar (1431 Royal St). From R-Bar the Bar Crawl heads over to Balcony Music Club (1331 Decatur St) at 2:30. After Balcony Music Club the Bar Crawl will meet at Turtle Bay (1119 Decatur St) at 3:45. Then to end the Bar Crawl everyone will meet at Molly's at the Market (1107 Decatur St) at 5:00. Each bar will be serving the Flambeau Red for $3.00 a pint during our hour there. The Krewe du Vieux Parade starts at 6:30 so everyone will be in perfect position. Yea for beer!! While in the Quarters make sure you stop by the Louisiana Music Factory (210 Decatur) for some great in-store concerts!! It's Gina Forsyth at 2:00 pm and Jack Brass Band at 3:00 pm...Remember to get your drink ticket for cheap beer down the street, and make sure you pick up a CD or album while your there - they've got the best music selection in town!! The Spotted Cat (623 Frenchmen) has a triple header starting early with Meghan Stewart & The Reboppers at 3:00 pm, Shotgun Jazz Band at 6:00 pm and top off the night with Davis Rogan Band again at 10:00 pm!! And curb your parade hunger for food and music over at Three Muses (536 Frenchmen)...Get some yummy food and listen to the sounds of the Pfister Sisters at 6:30 pm and stay on for the Frenchmen Street Jug Band at 10:00 pm. Grab some delicious brunch and some great music over on Esplanade Avenue at the Backroom at Buffa's (1001 Esplanade) with Some Like it Hot stirrin' up the pot at about 11:00 am...and if you're Uptown delight in the sounds of the Courtyard Kings starting up at 11:00 am over at Cafe' Rani (2917 Magazine)...And don't forget about The Columns Hotel (3811 St. Charles) on the other Avenue with some more yummy brunch and Chip Wilson! Nothing like some Bloody Marys and some great music! After brunch take a "free ride" over the might Mississippi to the Old Point Bar (545 Patterson) in Algiers...they've got the Craig Paddock at 3:30 pm! Stay on for the big game too! Sunday evening find your favorite spot to watch the game or the big Puppy Bowl (I heard there's gonna be a big kitty half-time show - probably much more entertaining then Madonna!!) Have a good one and "Go Eli"!! Happy Hump Day w/MG Masks, Opera and Lots of Music! Opera returns to Bourbon Street with The New Orleans Opera Association tonight at 7:00 pm at the Puccini Bar located at the Inn on Bourbon (541 Bourbon)! The Inn is located at the site of the French Opera House (1859-1919) and continues to celebrate its history with a live performance series. Special $5 parking is extended to all guests attending the performances. Lookin' for some dinner and then some music for dessert? Rock 'N Bowl (3016 S. Carrollton) is the place! Get some yummy dinner over at Ye Olde College Inn and then get a half price ticket to the show right next door at Rock N' Bowl....Tonight they've got Los Po-Boy-Citos at 8:30 pm - you'll be dancing the night away!